Oden's Extreme Lime Portion snus has a natural mellow lime flavor; a little tart and fortunately not too sweet. The tobacco flavor is more in the background but not the 2.2% nicotine level. This is a great summer snus that pairs well with beer and cola. Enjoy it all year long! 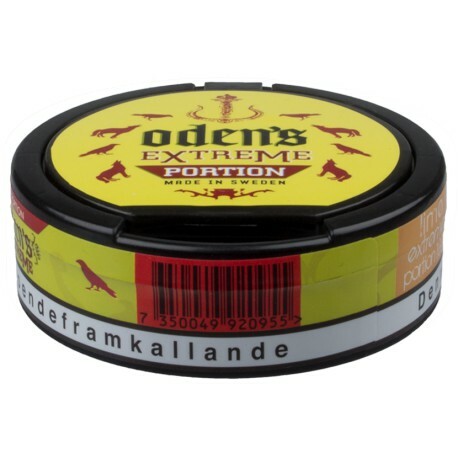 Odens Extreme Lime Portion snus is of course available very fresh and shipped very quickly by me, Moe Unz, and the team at the famous SnusCentral.com Snus Shop. Try some today! I honestly don't get much lime taste from it but the taste is still pretty darn good. I usually run with Thunder frosted but these are a nice change. Nice and big wet pouches with a pretty good nic hit. Flavor lasts a while, longer than others I have recently tried out for sure. Try a can and you might decide to add a roll next time. This is one of my favorite snuses. It taste just like a lime and has a sort of tanginess to it.